What does pediatric surgery have to do with superheroes? For orthopedic surgeon Dr. Steven Cyr, a lot. Dr. Cyr has developed OsteoCorps, a superhero universe designed to help alleviate the anxiety experienced by his young patients. Through OsteoCorps, children are put at ease, taught about their illness, and their own body’s ability to heal. 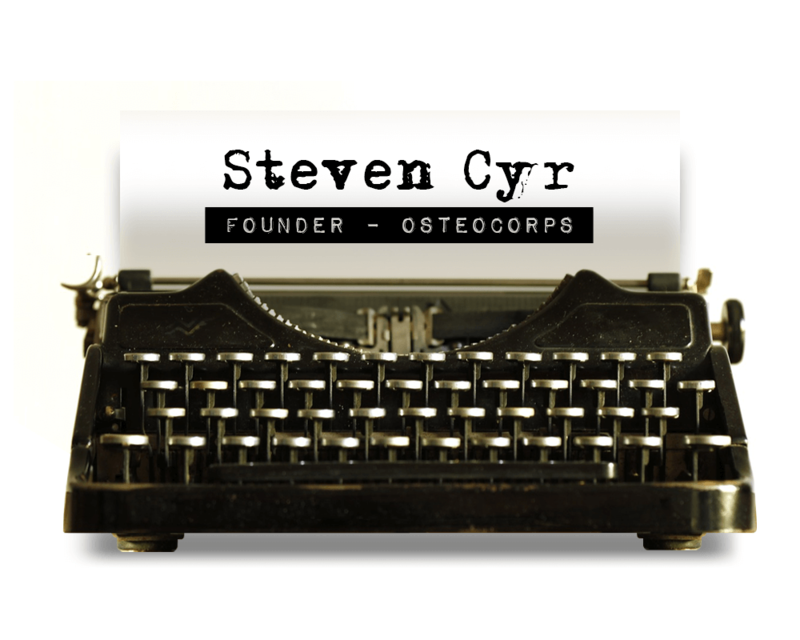 I wanted to find out from Dr. Cyr how all this began and what he envisions for the future of OsteoCorps. You set out to make orthopedic surgery less scary for children with an injury or illness. What inspired you to do that through the creation of OsteoCorps? I am an adult spine surgeon, but we added a pediatric division to our practice in 2012. I wanted to be sure the children being seen were put in an environment where they could feel inspired and protected by their surroundings. I wanted to create a practice that was so visually appealing and stimulating; it would take their minds off of their injury or deformity, or the treatment they were facing to address it. I have two sons and two daughters. My family loves superheroes, particularly my 5-year old. I felt that the most appropriate waiting room and clinic experience would be one in which superheroes were the theme and focus. However, I didn’t want the same superheroes we all know and love; I want the heroes and villains to relate to their struggle. I want to give them a sense of being protected by heroes who were there specifically to help them in their battle against injury and illness. My goal is to take their minds to a place where they could feel encouraged and inspired. The characters are designed to teach them about their condition(s) as well, because knowledge is power. I know that giving them knowledge demystifies medicine and surgery and alleviates their fears and anxiety. My hope is to inspire them never to lose hope, to understand they are being watched over, and potentially to encourage them to seek more knowledge and possibly a career that focuses on helping others. How did you approach the creation of OsteoCorps’ cast of superheroes and villains? It started with a coloring book. I created the initial characters, named after medical terms, in a coloring book. On one side was the image of the character in full color followed by a section of their POWERS and beneath that a section naming their Arch Enemy. On the opposite page was a blank image of the same character for the children to color while they waited to be seen. Each character was conceptualized based on their powers and inspired by my family and friends. Each specific detail was described to Brazilian artist Thiago Silva, and he would illustrate my ideas. The coloring book had ten characters (the initial ten heroes and the leader of the villains, FraXure). Upon seeing the coloring book, a friend asked if I had a comic book as well to tell the story behind the characters. At that time, I had the story in my head but hadn’t put in on paper yet. With his encouragement, I sat down and wrote the story. I’ve been writing medical articles and doing medically related presentations for many years, but this was my first experience as a comic book writer. I must say, it was a welcome and enjoyable diversion from the seriousness of what I do on a daily basis. After completing Issue #1, OsteoGenesis: Birth of the OsteoCorps, I sent the script to Thiago to illustrate. Once we were happy with the final product, the comic was printed in hard copy form and also converted into a digital comic as well. We traveled to Los Angeles to record the voices and worked with a team that included voice actor Mark Moseley (his work is heard Shrek I and II and Mulan I and II, Nutty Professor, and a host of other cartoons and video games), Kyle Townsend, and Grammy-nominated producer for Diane Warren. She created the soundtrack for the digital comic. That was very cool. The digital version is my favorite as it adds life to the story. It can be found on the Apple App Store and Google Play under OsteoCorps #1. Each Issue will be converted into a digital app so viewers can access it from their phones, iPads, etc. Your office is decorated with life-sized statues, superhero memorabilia, and artwork. 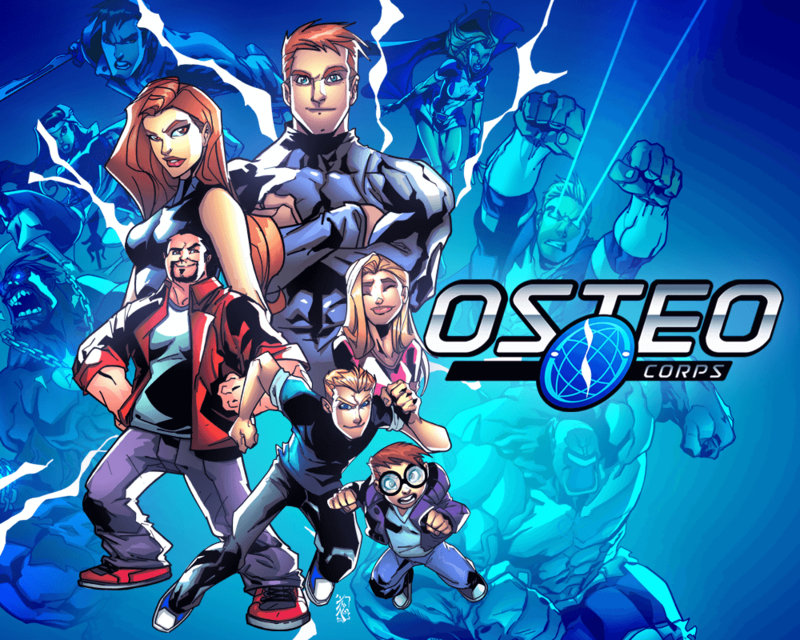 The OsteoCorps experience also includes social media, a comic book, and an iTunes app. How important is it to create a multimedia experience? Considering the modern age and the sophistication of today’s children, we decided to approach this comic in a different way. Most people view entertainment from their digital devices. I know my children are constantly watching shows and playing games on their phones and iPads. I want to reach as many people as possible because I know limiting this story to my clinic is only reaching a small percentage of the population. It certainly will never reach people from outside my state or country. I hope to spread this knowledge to children, teens, and adults throughout the world. All of us have experienced injury or disease either personally or through friends or family members. All of us seek to gain knowledge while being entertained as long as the format is created in a way that the education happens without being obvious. I don’t want this to be obvious. My goal is for the viewers to truly enjoy and relate to the stories like watching cartoons and movies about the X-Men, the Avengers, and Guardians of the Galaxy. The difference here is the stories teach us about our bodies, a frontier that has never been approached in this depth. Our bodies are more intricate, complex than any solar system or galaxy ever conceived by man. You’ve created an innovative approach to osteopathy and spinal surgery. How has this approach been received by colleagues in the medical community? It has been very well received. I have been contacted by several practices that treat children primarily. I have recently partnered with a local pediatric practice that has 11 clinics in central and south Texas. 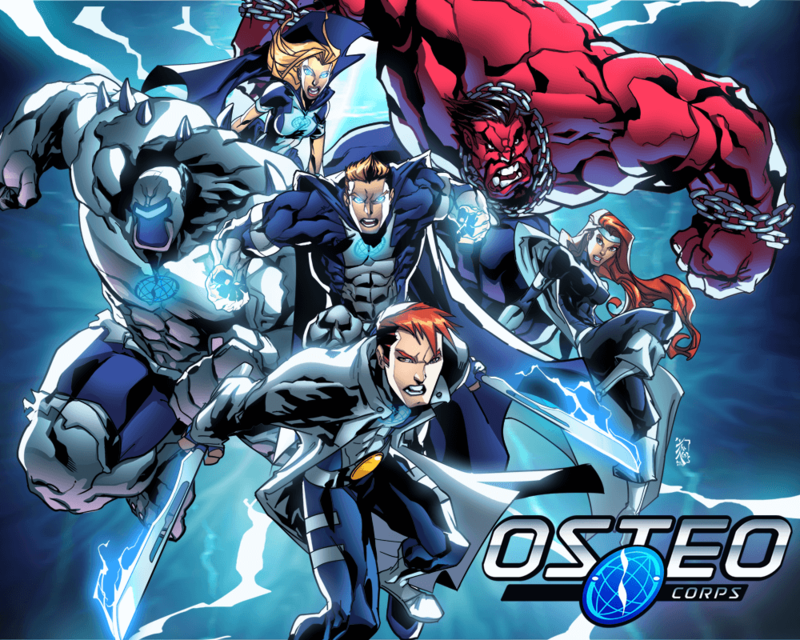 They have asked for permission to use the OsteoCorps characters for their waiting rooms and have ordered copies of the comic to distribute to their child patients. They are even planning to convert their primary practice waiting room into an OsteoCorps-themed waiting room similar to mine. There is another practice I am meeting with as well that focuses on pediatric rehabilitation who has also asked to use the OsteoCorps in a similar way. Others have been very supportive as well. I think that anyone truly interested in helping children and allaying their fears of the medical community sees the benefit of the OsteoCorps. Most physicians want to put their patients at ease and increase their understanding of the body to decrease fears and anxiety related to treatment. What better way than to do that through superheroes? How does this approach impact the young people you treat in your practice? It changed the way children responded to being in a doctor’s waiting room. When you see the children surrounded by these characters, reading the comic, coloring the coloring book, you can tell they are at ease. They have smiles on their faces. They are excited to be there. Their minds are clearly focused on the environment versus the fact that they are at a doctor’s office. It turns a scary experience into one of hope and understanding. What do you see as the next step in the evolution of OsteoCorps? We hope to turn this into a cartoon series and hopefully even a movie. The artwork Thiago is creating is amazing and his imagery is so inspiring. With each issue, the story and visuals are getting more exciting. Issue 2 is being illustrated now and, WOW, it is unbelievable! I can’t wait for it to be complete. I anticipate that will happen this month. We have met with producers in Hollywood who see the potential in the storyline and characters. I think people with the right vision can turn this into something unparalleled. We have met with Russell Simmons of All Def Digital, who is very interested in bringing this story to a broader audience. Hopefully, one day you will see the cartoon series, TV series, or movie version of this story. 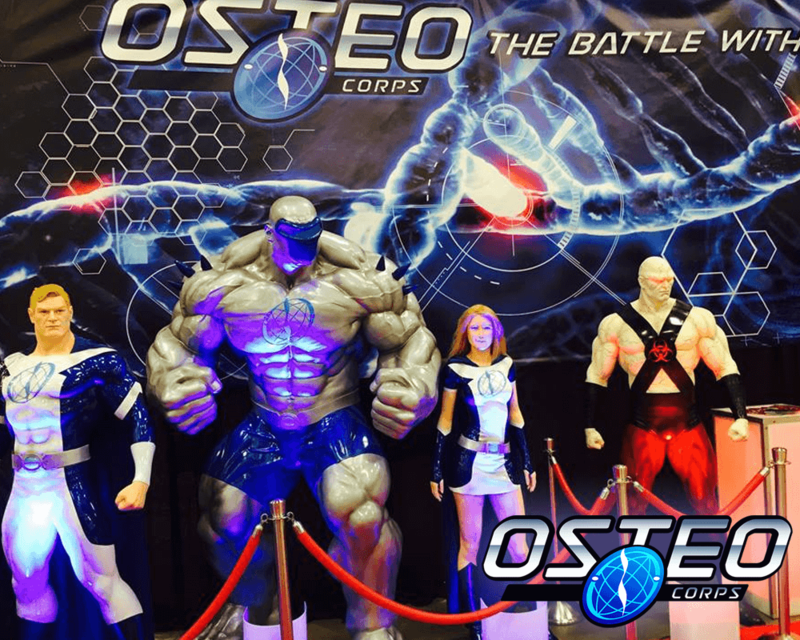 What’s amazing about the OsteoCorps is that it is based on actual medicine. The powers are derived from supercharged Stem Cells created by Ian Cision and Ann Cision, a husband and wife team researching a way to eradicate injury and illness. These stem cells accidentally spill on their children, converting them into superheroes with amazing powers. The Villains, once colleagues of Dr. Cision’s, steal the serum before the Cisions can disseminate it around the world to heal everyone. However, as their intent is malicious, they become Super Villains, the MalUnion, instead of superheroes. The foundation of the story is the Cisions teaching their children, now imbued with superpowers, their responsibility to use their powers for the betterment of humanity while staving off the attacks of both disease and injury as well as the MalUnion.